This is very interesting, and inspiring. 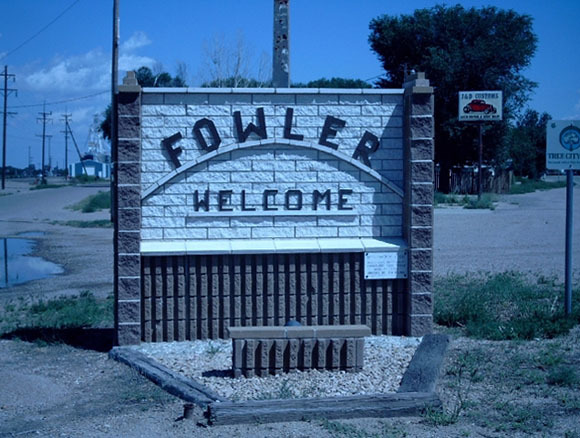 Fowler, a small town in Colorado, USA, with a population of slightly over 1,000 have recently became a standard-bearer for towns looking to become green town. It went grid neutral, i.e., producing as much or more power than it uses. How many towns, or even villages around and near you that have population of 1,000? Many, I bet. I know of some villages/towns that span some tens of acres that boost a population of 1,500 and above. We are not particularly interested in the inhabitants but rather lessons we can learn from what the folks did in Fowler. The initial motivation, according to the town's former administrator, Wayne Snider, was to save money but they realised that it was also the potential to create more jobs. One initiative that came to fruition was a 600 kWp photovoltaic panels at seven sites around the town on municipal property. It was a $1.2 million project that sells the electricity back to Fowler at about half the rate of the current utility. First year saving from this initiative was estimated at $20,000. Others that have been planned were 2 MWp solar array at the south of the town, and an anaerobic digestion plant that would create 45 jobs which could bring Fowler closer to grid-neutrality. These did not materialise though, after the change in the leadership of the small town lead to changes in the solar rebates policy. Snider has since move to work on similar green projects at other towns in Colorado. With the numerous green campaigns by both public and private sectors in Malaysia, I believe that a large majority of Malaysians would have now become aware of the importance of Renewable Energy and many would like their energy coming from clean energy sources. This can be done less expensively if the appropriate structure is developed. It takes people with an open mind who have a desire to make change for the better. We know that we can benefit from the recently gazetted Renewable Energy Act 2011, but I feel that sometimes we don't need everything to be legislated for new green ideas to flourish. Fowler is a small town and it is the smaller townships that are more suited for these sort of programmes as they can cut much of the cities red tape. Lastly, if you have small town that is away from the grid, why not think about combining solar photovoltaic, bio-gas and wind mills to supply small power for the town? It's called decentralised power and it's green! More lessons can be learn from what Gussing, Burgenland did for its 3,764 or so population. Note: The Fowler story can be found at Renewable Energy World. a place where TNB is trying out the green way by way of 2x100kw Wind Turbine,a 100kw solar farm and 2x 100kw Diesel Gen set. but sad to say the wind turbine have been down for almost a year now and it will become another white elephant project one which 100m high up the hill if nothing is done to get it repaired. @thomas. That's too bad. How can they just leave it to rot like that? What a waste. That's Malaysian mentality,buy or build anything but never put routine maintenance in the budgeting,as thought things can last forever.